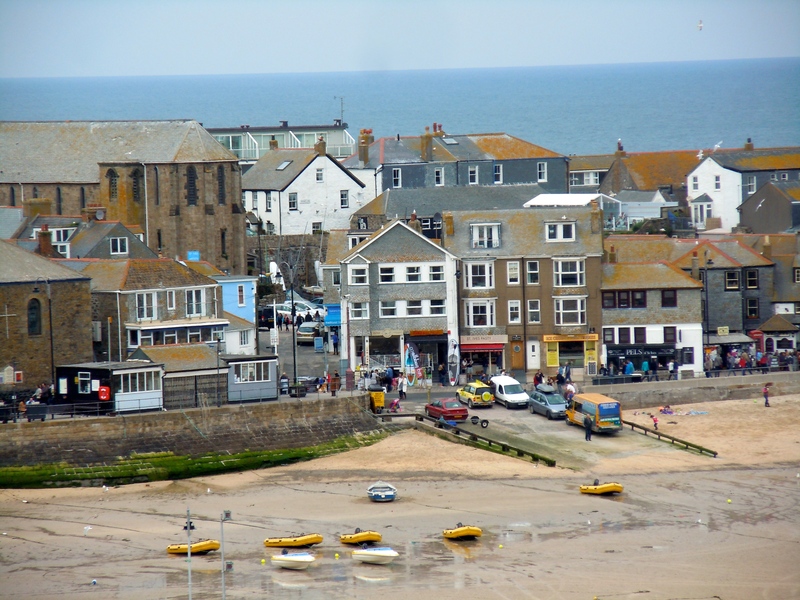 Nestled in the hillside of the rugged Cornish coast is the picturesque town of St Ives. Curving majestically out to sea, its landscape lined with cottages, its shoreline dotted with colorful boats of all sizes, it beckons you to walk her cobblestone streets and climb her wind-worn hills. Before leaving for this trip, my friend, Colleen, suggested I connect with her cousin, Doreen, while I was in Cornwall. 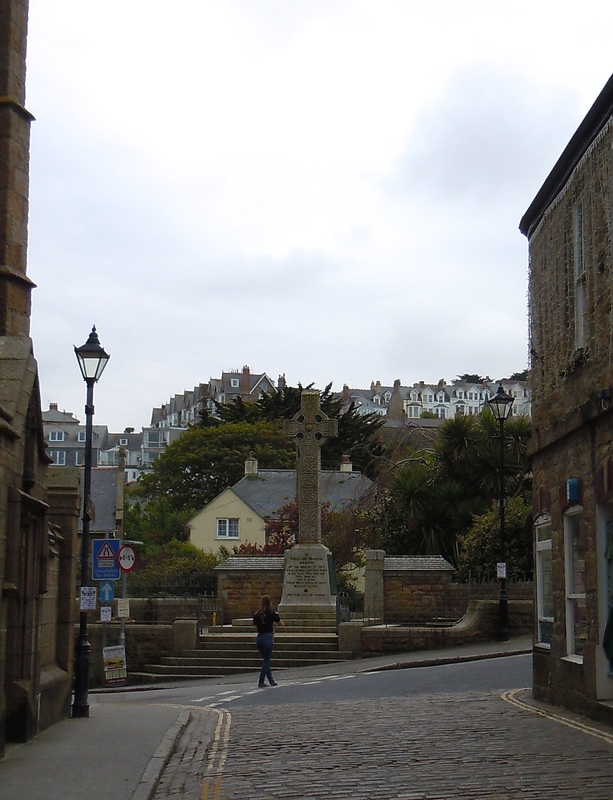 So after contacting Doreen, Mark and I walk the short distance from our cottage to the bus depot in Penzance for the 30 minute ride to St Ives. The bus ride through the rolling hills and valleys of the English countryside is ripe with opportunities for photos, but our ‘drive-bys’ just can’t capture the beauty of this mystical land. 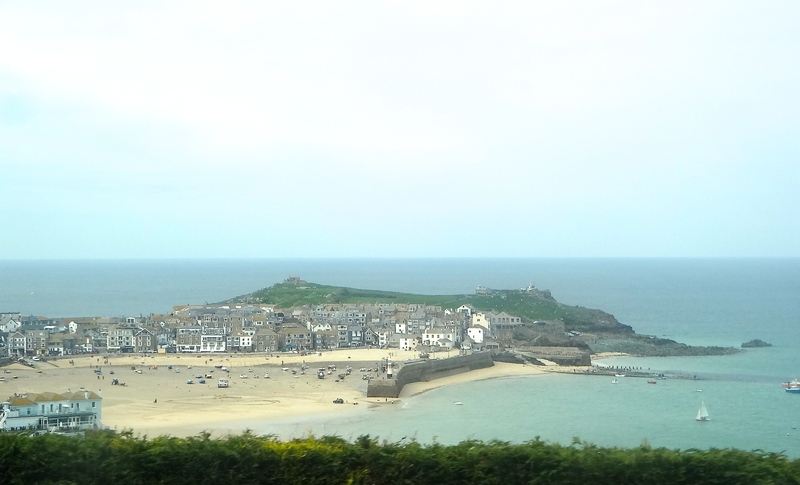 The St Ives bus depot is perched high above the bay providing a perfect opportunity to see the curving Southeast tip of the town as it juts elegantly into the sea. 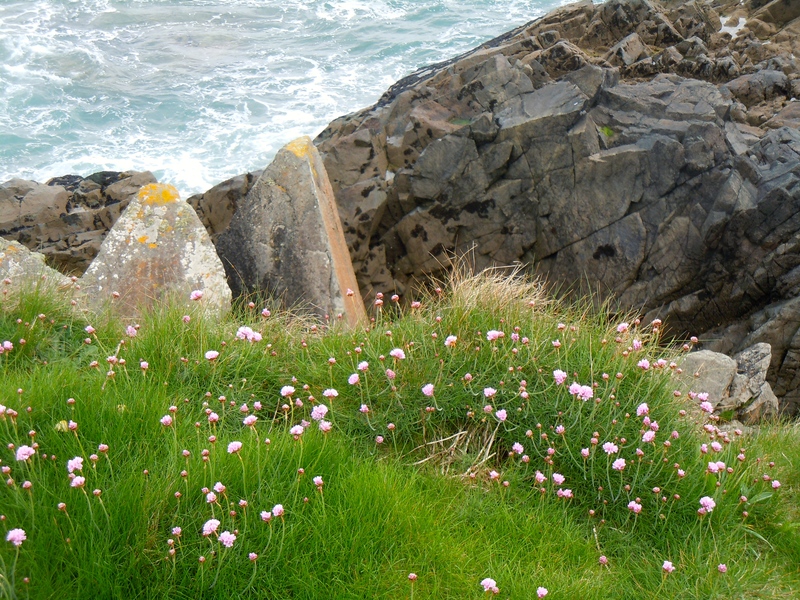 On the other side of the hillside, you can see the vastness of the Celtic Sea in all its splendor. Doreen’s daughter, Janine arrives, walks over to us and asks, “Are you American?” I wasn’t expecting anyone quite so young, so after a bit of confusion, we begin our adventure and meet Doreen part way down the hill on our way into town. 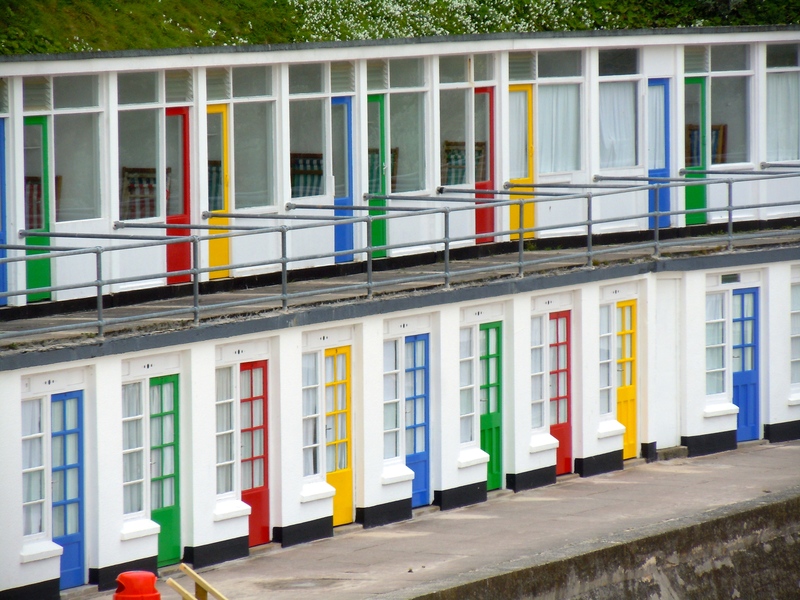 Doreen has lived in St Ives for several decades, first in a cottage in town and now on its edge. As we walk arm-in-arm through winding back streets, past shops not yet open on this cold and windy Saturday morning, Doreen shares the town’s history and her story. It’s easy to see why she settled here and why she stays! We arrive on the far side of town at a beach called Porthmeor. The sea moves from a pale green closer to shore, to a light shade of blue on this overcast day. As it touches the sky, the colors blur and except for the occasional darker blue hue, it’s difficult to discern the horizon where the Celtic Sea becomes the Atlantic Ocean. An open-air cafe sits perched above the white sand beach surrounded by glass shielding its occupants from the wind coming off the surf. Colorful cabanas add to the ambiance. 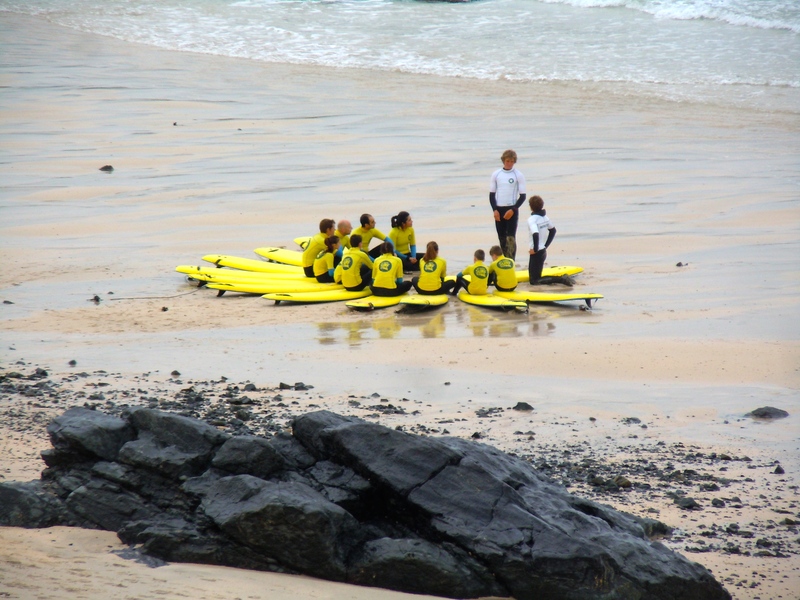 The St Ives Surf School is holding court, decked out in bright yellow like a sunflower opening its petals toward the ocean waves. The students are paying close attention to the master as the waves lick the shoreline, begging them to grab their boards and enter the aquamarine world. We head toward the island at the tip of St Ives. “The island” is not really an island, as it’s firmly attached to the mainland, however, it is surrounded on three sides by the sea. Sitting on top is St Nicholas Chapel, dating to Medieval times. Walking up the hill, precariously close to the rocky edge, we move around and up until we reach a fork in the path. The rocks are splattered with orange and golden lichens. Small pink, yellow and white wildflowers dot the landscape, appearing in the crops of grass and wherever they’ve managed to hang on. Sea birds fly and hang in mid-air, taking the up-drafts and diving into the sea. 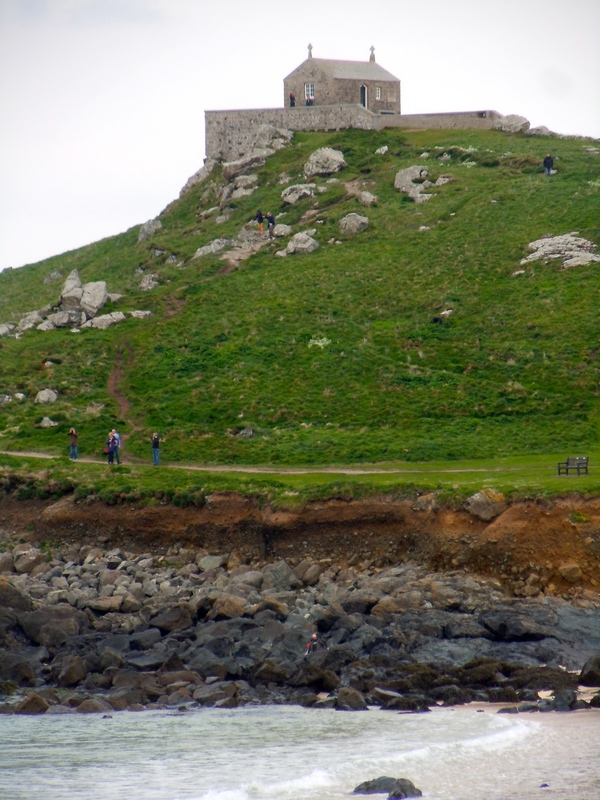 Doreen and I continue around the island to the harbor side, while Mark and Janine continue up the hill to get a closer look at the one room granite chapel, stoically looking out to sea. Later, Doreen will tell us tales of how pirates used to land on the island, hiding their loot in caves to be transported inland, while the chapel was used as a lookout in an effort to prevent the smugglers from gaining access. We wait for Mark and Janine and then head back down to the town, passing by the small protected Bamaluz Beach, past shops and rental cottages to the harbor, where we stop for lunch at the Lifeboat Inn. 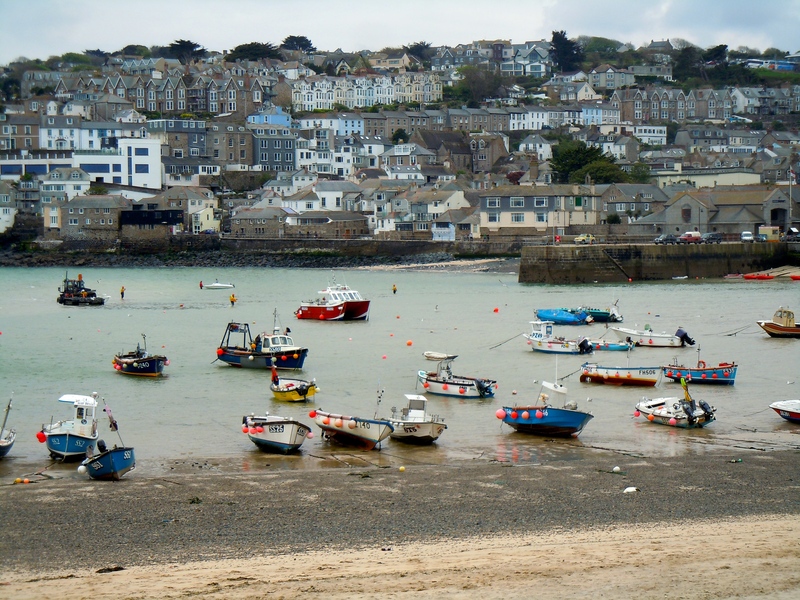 Historically, St Ives was a fishing village. Today, it’s an artist community, the transition occurring around the time the fishing industry was declining and the new railway provided easier access. Artists came for the light and beauty of this village by the sea. After a great lunch, we meander through the cobblestone streets and back alleys, wandering up and down the hills, gazing into shops and small gardens, tucked away in interesting places. We visit several art galleries, our favorite being the New Craftsman Gallery on Fore Street, where I admire a number of works by artist, Emma Jeffryes, and Mark purchases a couple of paintings. It’s clear we could spend more time here, but we have plans for the evening, and so we say our farewells to our lovely new friends and catch the bus back to Penzance. With its history, charm and beauty, combined with its many galleries, including the Tate opened by H.R.H. 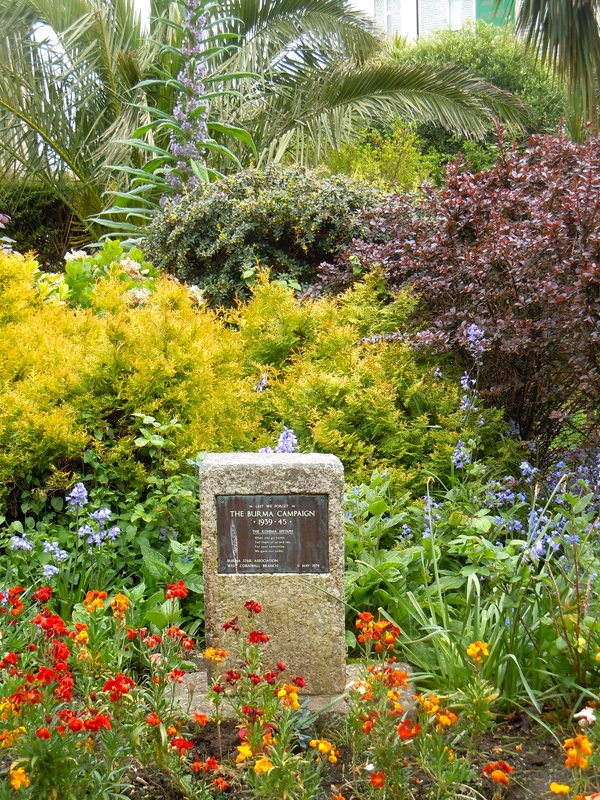 Prince Charles in 1993, we can see why St Ives is such a great tourist destination and why Doreen has spent so many wonderful years in this picture perfect place! This entry was posted in Cornwall, England, Travel and tagged Art, Art Galleries, artist community, beaches, Celtic Sea, Emma Jeffryes, New Craftsman Gallery, Porthmeor Beach, St Ives, St Nicholas Chapel, Tate Gallery, tourism, tourist destination. Pictures are lovely. Description of St ives fits it to a “T”. I definitely need to go back to the UK. It is the long haul from London to St Ives that holds me back but we will see .Again another wonderful story.